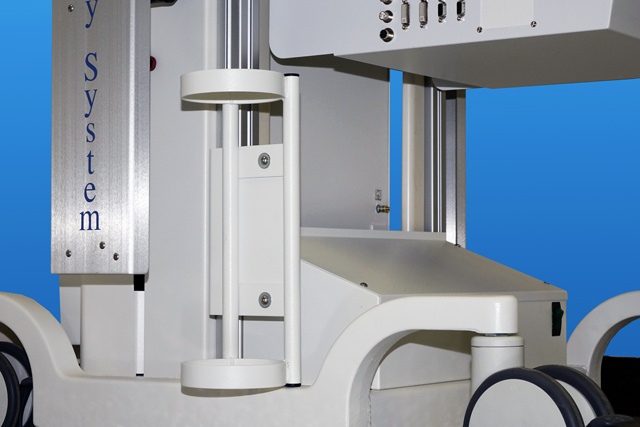 The MDS adapts to the desired clinical need, monitor arms are moved to the desired location and retracted up out of the way when finished. Zero room down time, planning or installation cost. Adjustable shelves provide ample space to mount video components and in most cases reduces the number of carts required in the room. 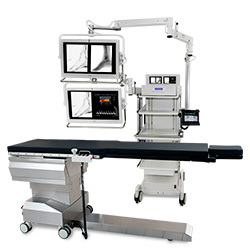 Reduces the ceiling mount conflicts between the lights, monitor arms and equipment booms while still presenting clinical images in a superior location and viewing angle . 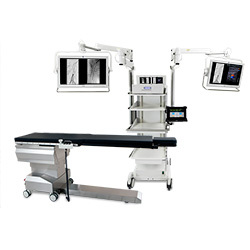 The MDS stand provides a wide-range of vertical and horizontal positioning for convenient placement of video monitors at the desired location during surgical, interventional and diagnostic procedures. The stand includes three equipment shelves for placement of ancillary equipment such as cameras, light sources, printers and more. 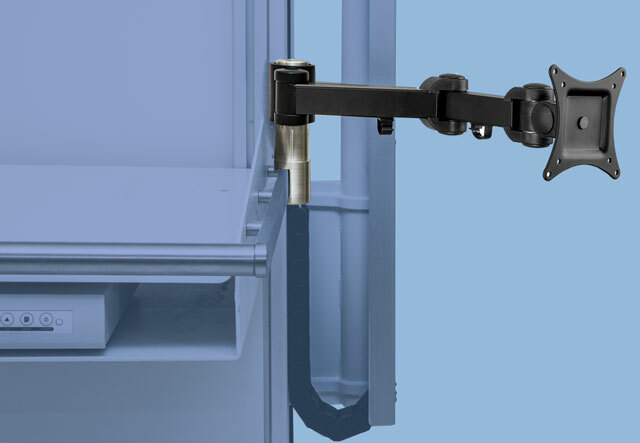 Dual articulating arms with positioning handles and low-force manual motion for easy video monitor positioning. Fully counterbalanced manual height adjustment of articulating monitor arms with manual pivot and rotation of monitors. Cable track allows vertical height adjustment of arms without cabling stress. Four built-in, adjustable equipment shelves: 19.75” (50 cm) wide x 19.75” (50cm) depth. Maximum shelf load per shelf: 25 lbs. (11 kg per shelf). Lockable double-wheeled 6” casters with cable pushers. Rear casters include steering lock position for easy transport. Ergonomic transport handles, front and rear, for easy transport and positioning. Built-in storage compartment for monitor protective covers. Built-in isolation transformer and AC power strip for connection of system video components and up to five available outlets for connection of ancillary equipment. North America Version: For connection to 110- 120VAC, 60 Hz, 15 amp outlet. Includes built-in 1,800 Watt isolation transformer and 15 amp power cord and hospital grade plug. Maximum allowable combined load on MDS power strip = 12 amps. EU Version: For connection to 220-240 VAC, 50 Hz, ~10 amp outlet (must specify country plug type). Includes 1800 Watt isolation transformer, power cord and plug. Maximum allowable combined load on MDS power strip = 7.5 amps. Tablet controlled. Allows any input to be routed to either monitor and allows any two inputs to be displayed on a single monitor in picture-in-picture or split screen format. Should the tablet ever be lost or broken, backup controls on the ControlOR video router can be used. One DVI-D – for connection of external devices such as printers, DVRs, etc. The ControlOR video router also has audio input/output, LAN and Ethernet connections. The preview monitors are mounted to the MDS stand center column above the top shelf for easy visualization of video routing while operating the ConductOR touchscreen control. 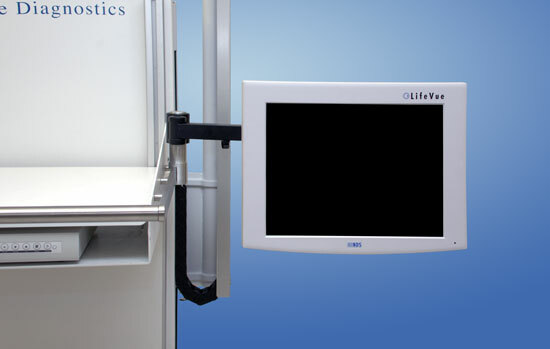 The left and right preview monitors serve as visual reference for the left and right 26″ monitors mounted to the MDS articulating arms. Foam padded construction for monitor glass protection during transport and storage. Cleanable fabric cover material with Velcro straps for easy cover attachment and removal. Fully-counterbalanced articulating arms for easy manual positioning with up to 36” (91cm) vertical travel and up to 81” (205.7cm) horizontal extension. High-brightness LED monitors display over-the-table images in wide-screen, picture-in-picture or split screen modes. 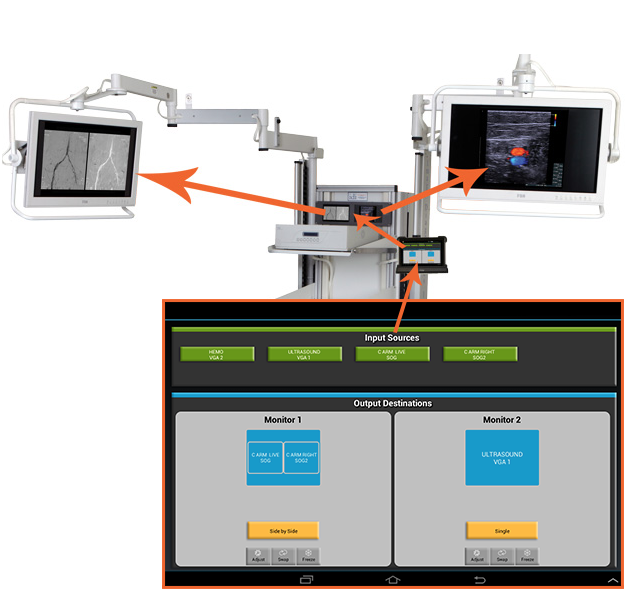 The MDS accepts analog and digital signals from multiple sources including: C-Arm, ultrasound, hemodynamics, microscopes, cameras, image guidance, PACS and all image intensifier and flat detector fluoro technologies. 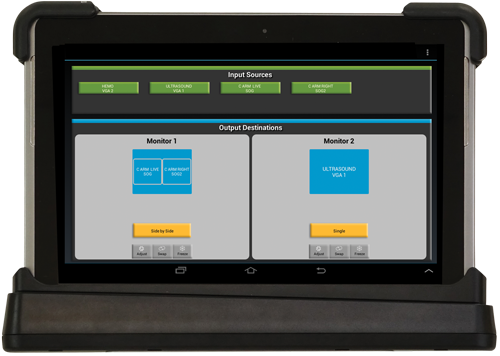 Intuitive touchscreen tablet video routing allows easy selection of image location and format. 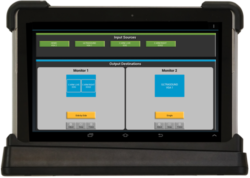 User-specific settings can be saved and recalled for easy procedural set up or customized to meet a specific need. 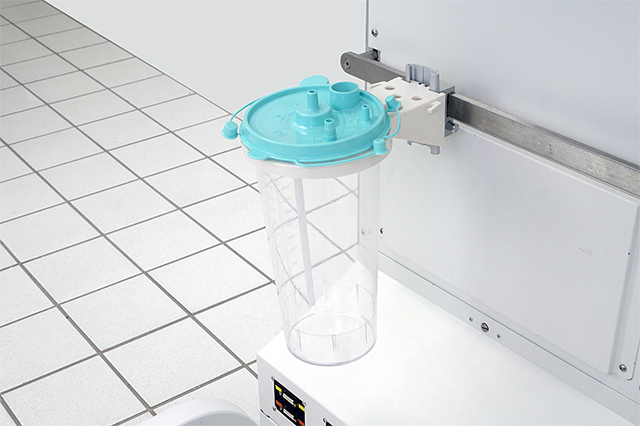 Combine MDS with your C-arm and mobile table for a completely portable suite for urology, vascular, GI or other applications. The MDS system is the perfect alternative solution for small rooms, low ceiling heights, or construction restrictions that make fixed systems impractical. The MDS is the perfect solution to these unique opportunities and can help maximize your room potential. The MDS requires no time-consuming site planning or construction expense and has a substantially lower acquisition cost than fixed room solutions. 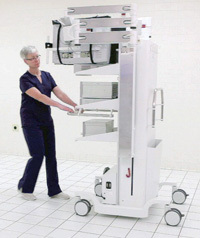 Fixed boom systems require perfect placement and infrastructure changes in order to satisfy every possible current and future clinical application. 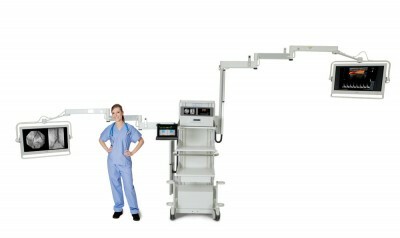 The MDS system is portable and does not require changes to existing infrastructure. 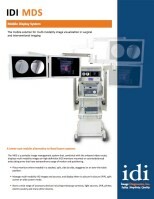 The MDS mobility and positioning versatility allows convenient layout of the OR for virtually any procedure. Fixed room configurations may tie surgeons to specific rooms and may limit scheduling options for OR management. 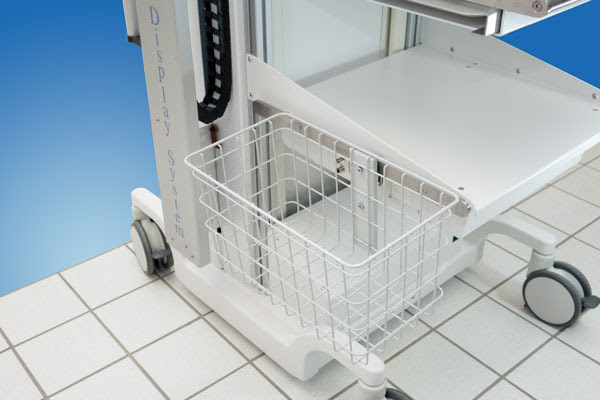 The MDS adapts to the room, or the procedure at hand, and can be configured to be a multi-functional clinical procedure cart. 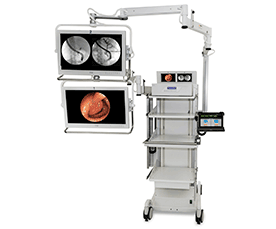 The MDS accepts virtually all video sources from a wide variety of medical device companies. The system can be reconfigured if your technology changes, making it easier and less costly to upgrade and keep your OR state-of-the-art devices. Includes medical rail shelf with two bilateral slide-out shelves for MDS or MDS D.
Shelf Includes medical rails. Add if equipment may overload the standard 3-shelf configuration. 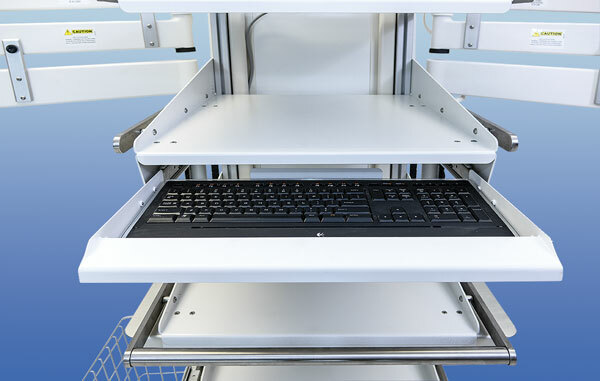 Kit includes: (A280-0130) medical rail shelf with sliding keyboard carriage for customer-supplied keyboard. Carbon fiber, shoulder mount (attaches by sliding thin section under patient/table pad), flat. Includes pad and strap. Attaches to IDI tables with accessory rails – or can be used with a clamp on accessory rail on tables or areas within a table that do not have accessory rails. Length: 23.5 inches (600mm). Kit includes the mounting clamp and articulated arm for mounting a third 15” monitor (10 lb. max load) or patient monitor. Includes: 2 suction canister rail clamps and brackets suitable for 3000 ml canister. Cable storage J-hook for external cables. Includes pair of CO2 bottle holder brackets for customer-suppliedinsufflator. Bottle and accessories supplied by customer. 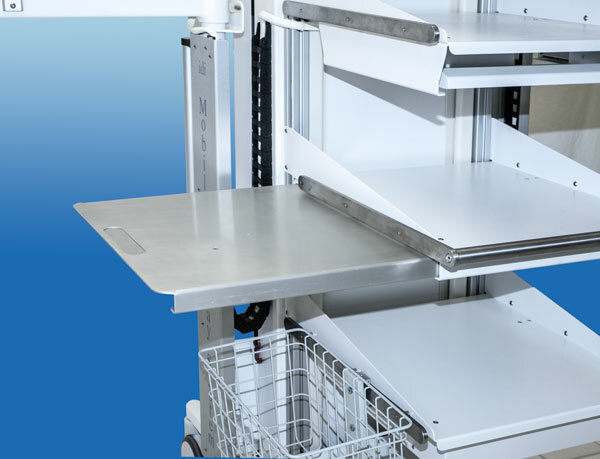 Includes: Medical rail shelf with under-mounted nook that will accommodate a DAU switcher, freeing up shelf space. Customer installation only. 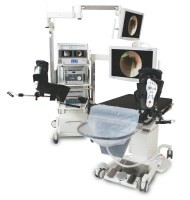 Nook size: 4” H x 19” W.
Includes: NDS 15” medical grade monitor, Articulated Arm Kit # A282 – 0016, DVI cable, and DVI output module (to printer), and 3’ DVI dual link cable. DVR and digital printer are not included. Prep Kit permits observation of the images sent to a digital printer and aids input/visualization of on-screen patient information. Kit includes cables for any external device that is not mounted directly onto the MDS stand (i.e. ultrasound, PACS, hemodynamics). 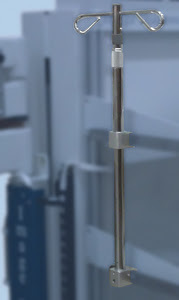 Includes two IV rail clamps and two-hook IV Pole. 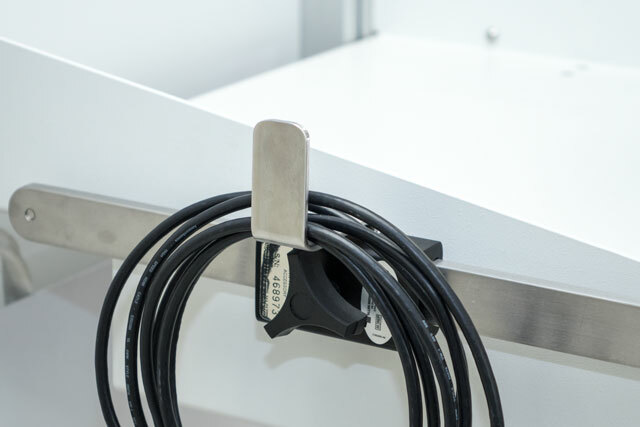 Clamps are suitable for mounting 4’ 2-hook IV pole onto two medical rail equipped (A280-0130) shelves. Note: this option requires two shelves with medical rails.